Not to be confused with The Pennsylvania Gazette, the University of Pennsylvania’s alumni magazine. The newspaper was first published in 1728 by Samuel Keimer and was the second newspaper to be published in Pennsylvania under the name The Universal Instructor in all Arts and Sciences: and Pennsylvania Gazette, alluding to Keimer's intention to print out a page of Ephraim Chambers' Cyclopaedia, or Universal Dictionary of Arts and Sciences in each copy. On October 2, 1729, Benjamin Franklin and Hugh Meredith bought the paper and shortened its name, as well as dropping Keimer's grandiose plan to print out the Cyclopaedia. Franklin not only printed the paper but also often contributed pieces to the paper under aliases. His newspaper soon became the most successful in the colonies. On August 6, 1741 Franklin published an editorial about deceased Andrew Hamilton, a lawyer and public figure in Philadelphia who had been a friend. The editorial praised the man highly and showed Franklin had held the man in high esteem. On October 19, 1752  , Franklin published a third-person account of his pioneering kite experiment in The Pennsylvania Gazette, without mentioning that he himself had performed it. Primarily a publication for classified ads, merchants and individuals listed notices of employment, lost and found goods and items for sale; the newspaper also reprinted foreign news. Most entries involved stories of travel. 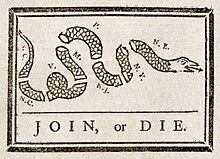 This newspaper, among other firsts, would print the first political cartoon in America, Join, or Die, authored by Franklin himself. It ceased publication in 1800, ten years after Franklin's death. It is claimed that the publication later reemerged as the Saturday Evening Post in 1821. There are three known copies of the original issue, which are held by the Historical Society of Pennsylvania, the Library Company of Philadelphia, and the Wisconsin State Historical Society. Today, The Pennsylvania Gazette moniker is used by an unrelated bi-monthly alumni magazine of the University of Pennsylvania, which Franklin founded and served as a trustee. Archives are available online for a fee. ^ a b c "Pennsylvania Gazette, Philadelphia". Library of Congress. 2006. Retrieved December 7, 2006. ^ Konkle, Burton Alva (1932). Benjamin Chew 1722–1810: Head of the Pennsylvania Judiciary System Under Colony and Commonwealth. Philadelphia, PA: University of Pennsylvania Press. pp. 17–29 (28–29). ^ Zach Hutchins, "Travel Writing, Travel Reading, and the Boundaries of Genre: Embracing the Banal in Franklin's 1747 Pennsylvania Gazette," Studies in Travel Writing 17.3 (2013):300-19. ^ "Today in History: January 17". Library of Congress. 2006. Retrieved December 8, 2006. This page was last edited on 15 October 2018, at 14:31 (UTC).